One of the most important things we all have to do in business nowadays is write copy… because we live in an online world, where we communicate with our audience through social media, emails and blog posts. However, writing does not come naturally to most of us entrepreneurs, so we can end up spending a lot of time struggling to know what to say or how to say it! Often we just end up writing stuff that doesn’t really feel like we want it to… we can’t quite figure out our own voice. This is a huge problem, because the words we type out communicate our brand to our audience, so in order to spread our message and connect and resonate with them in the right way, we need to be typing the right words. 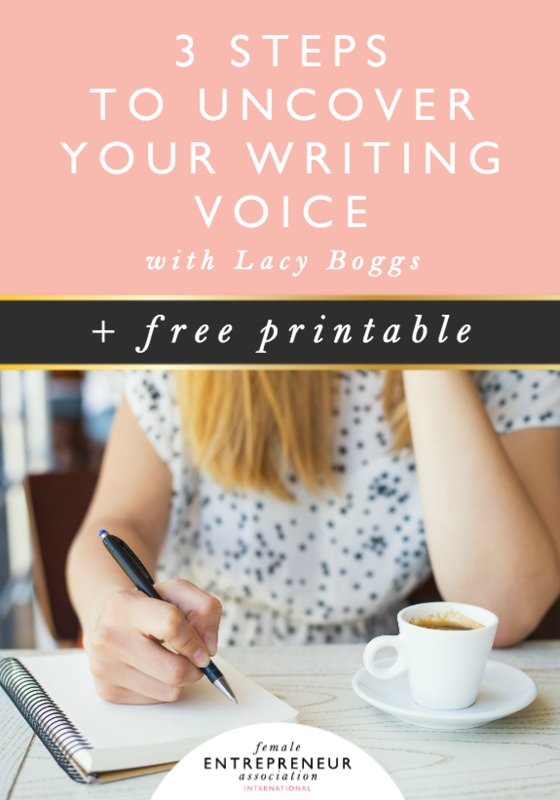 If this is something you struggle with then fear not, because in this week’s 10 Minute Masterclass the amazing wordsmith, Lacy Boggs, shares some of her amazing top tips to help you find your true writing voice! How tiny differences in the words you use can have a big impact! Helping you develop your voice that is true to who you are. GIVEAWAY: Make sure you leave a comment below and share with us what you want your writing voice to say about you & your business and be in with a chance of winning a 6 month pass to the Members’ Club! Lacy Boggs is an innovative wordsmith helping entrepreneurs develop and streamline strategies & writing rituals, to create effective blogging content that converts their readers into clients. Your writing voice is how people will get to know you, who you are and what they can expect from you and your business. Finding your voice won’t happen over night, it definitely takes plenty of time to develop. Try not to compare yourself to others out there & try to avoid copying another person’s style which might not necessarily be suited to you. You don’t want to say to yourself “I need to sound more professional” just because you’re writing about your business, let your voice develop over time to represent your true self rather than trying to push it. If you’re looking to develop your voice you need to look closely at the words you’re using because that’s where your voice is. There are lots of different ways to say the same thing but the words and phrases we choose can completely change a simple sentence. Buy my product. Get my product. Acquire my product. Invest in my product. Each one has a different flavour. You might use buy or get if you were selling something lower priced and flashy, or if you were writing for a more eloquent business or item, you might use acquire or invest. They all say the same thing, but in a different way. Everything you write is copy and represents your brand. Whether that be emails, your website, Twitter or your blog, they all represent you and your brand so make sure you are consistent with your message and the way you put it out into the world. Take 10 minutes out of your day to take a look through your personal Facebook, a journal or perhaps a personal blog and pay attention as to what language you’re using when communicating with your friends or privately in a diary. How can you integrate your style of writing in your copy for your business? Come and share what you find over in the Facebook group and leave a comment below! To Be Entered to Win: Leave a comment below sharing what you want your writing style to say about you!